Bishop Ruben Saenz Jr. told about 125 confirmands and youth group leaders that their journeys are similar to the athletes in the Winter Olympics. Likewise, the bishop said, the athletes didn’t just get their on their own, as he showed photos of snowboarder Shaun White and skier Mikaela Shiffrin with their coaches. “God has put people in our lives to help us, encourage us and raise us up,” Bishop Saenz said at the Feb. 17 rally at First United Methodist Church in McPherson, Kansas. Another rally will take place March 3 at Nebraska Wesleyan University in Lincoln. Registration is $10 per person, and the deadline is Feb. 24. Meanwhile, 15 high school students participated in the DEEP Leadership Training, learning how to be effective leaders in their churches and communities. That training also will be repeated March 3 at Nebraska Wesleyan. Registration is also $10, and also has a Feb. 24 deadline. Bishop Saenz said youth can have an impact in their church and community, pointing to a teenager in the Parsons District who raised $10,000 for the homeless by selling beaded necklaces made by herself and her mother; and members of the high school football team who attended Derby Woodlawn UMC in Kansas who stepped up in an anti-bullying initiative. “The goodness of God dwells in us,” Bishop Saenz said. During the Confirmation Rally, youth heard from Laura Podschun, a Winfield native, Southwestern College student and intern at Winfield First UMC. She said becoming a Christian means giving your heart, soul and mind to Jesus. Podschun encouraged the youth to journal daily as a way to stay connected to their faith and the world around them. The praise team from McPherson First UMC led the confirmands and leaders in a rousing opening worship. In more solemn moments, the youth remembered their baptisms with water on their foreheads, administered by Bishop Saenz and the Rev. Karen Rice Ratzlaff, lead pastor of McPherson First. After Bishop Saenz’s final talk with the youth, he and the Rev. Nathan Stanton, director of congregational excellence, and two youth served communion. Confirmands also packed health kits and school kits for UMCOR and learned about leadership opportunities in the church, as well as participated in a Q&A with Bishop Saenz. The day left an impression on Jocelyn Woerner, a confirmand from Superior, Nebraska. “I thought it was amazing,” she said, while “learning about God and interconnecting” and “meeting lots of people” will stick with her for some time to come. Joseph Sousa, a confirmation student at Wichita Mount Vernon UMC, praised the day as “really fun,” and will remember packing the UMCOR kits. “It’s just helping out the community,” he said. 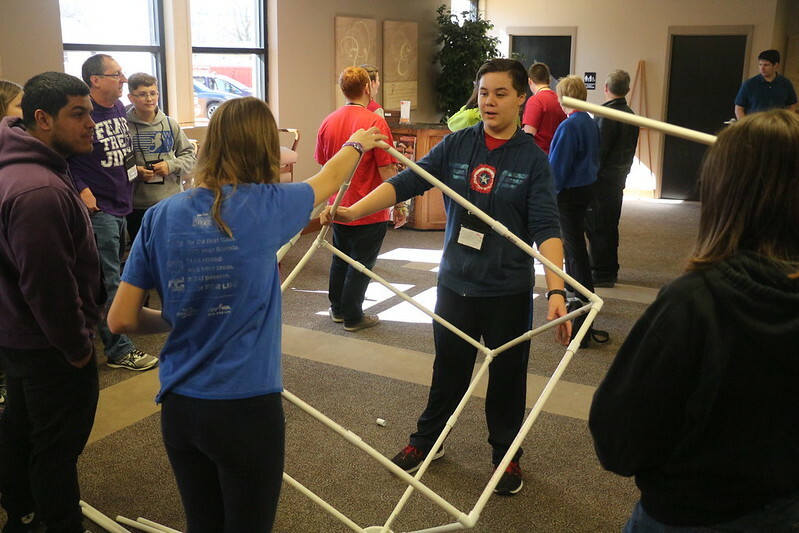 During the DEEP Leadership Training, high schoolers were challenged by the Rev. Justin Lefto, pastor of The Benton Church, a United Methodist congregation in Butler County, Kansas, to step up and become leaders in their churches and communities. After worship led by Zachariah Kirkham, who also performed for The OneEvent earlier this year, youth participated in a speed-dating style exchange about God’s impact on their lives. They also answered questions in a game show format, using clips from various TV series and movies, about the correct way to handle the illustrated situations; and shared whose faith journeys had impacted their lives.